As a child, I was fortunate to be surrounded by intuitive, imaginative cooks. Growing up in Mokena, Illinois, our family found lifelong friends and partners in food love in our neighbors the McNamaras, the Billottis and the Bernardins. Sharing holidays with these families was special for both the company of warm, loving friends and for the distinctive, traditional dishes. The McNamaras hosted Easter morning each year. Concentrating on the early church service was nearly impossible; the anticipation of their sweet and egg-y French toast casserole and their specialty of hard-cooked eggs wrapped in spicy breakfast sausage and roasted in the oven was all-consuming. The women of these families gathered before big church functions and created, under “Aunt” Lorraine Billottis’ direction, hand-made savory meatballs and Italian red gravy (aka spaghetti sauce), simmering pork neck bones and Italian sausage with tomatoes, herbs and spices. Coming home from school and being greeted by these aromas, pots of sauce all over the kitchen, was just too tempting for my nose and my little fingers. Just mouthwatering! Thanksgiving morning belonged to the Bernardins; an exquisite brunch was served at their floral shop. Over twenty people would eat their fill of eggs, bacon, pancakes with all the fixings; juicy fruit, honeyed syrup and fluffy whipped cream. Best of all of these cooks, of course, was my mother. Mom was innovative, creative and willing both to share her knowledge of food and listen intently to learn from others. Great food was a passion second only to the love she had for us, her children. Mom was an inspired chef, creating originals like fried malt-o-meal drizzled with warm maple syrup. One of my favorites was toast spread with cottage cheese, sprinkled with cinnamon and sugar and glazed to a golden crust under the broiler. Mom’s bread was unmatched – and her coffee cakes! With almond, poppy seed and apples, drizzled with powdered sugar icing and spread with soft butter, my mouth waters even now just thinking about them. As you can tell, I did not grow up as “the skinny kid” in my neighborhood – and I learned my love for cooking good food at a very young age. My childhood came to an abrupt end on March 9, 1980 when my astounding, amazing mother passed away. As my dad was working and traveling, we kids had to fend for ourselves. Cooking became a big comfort as I created dishes for my teenage friends. The dish they begged for most was my real old-fashioned hamburger, seasoned with a special blend of salt, pepper, herbs and spices. With a slice of cheese placed on top, I would cover the pan and let that cheese melt slowly and steam the buns. After high school, I attended trade school and became a carpenter. The mid 80’s were rough on this profession and I needed to support myself. I realized that everyone still needed to eat and returned to my roots – food. Orland Park’s Fox’s Pub took a chance and hired me as a pizza maker. I loved every bit of the business – this was truly home to me. Each day was a learning adventure, with new methods, tastes and techniques to master. Within a year, I was promoted to line cook and learned prep work, steak cutting, sausage making and soup making. Driven by an ‘appetite’ for knowledge, I attended culinary classes at Joliet Junior College. When the Holiday Inn in Matteson hired me (mostly for my enthusiasm) as they opened, I planned menus for two restaurants and the banquets. 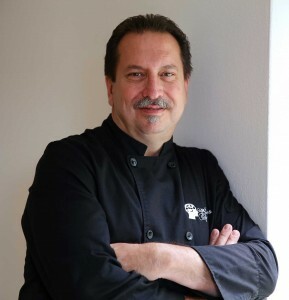 The owner then hired Executive Chef Michael Papandrea from the New England Culinary Institute in Montpelier, Vermont. He brought with him a banquet chef, a pastry chef, and a chef Garde Manager and also hired a butcher. The learning opportunities were beyond imagination – I still remember making 500 individual soufflés! Soon, I was the Executive Sous Chef at the Radisson in Downers Grove and was able to cook for many celebrities. My favorite story – on a busy Saturday night, I was swamped in the kitchen. Our F & B Director came into the kitchen and announced the presence of Justin Wilson, the Cajun Chef of television, in our dining room. Just what I needed on such a busy night! I decided to take a risk and opened six of the best fresh oysters. Saving the shells, I slowly poached the oyster meat in a pan of champagne, added some finely diced shallots, seasoned it with salt, pepper, and my personal concoction of seasonings. Removing the meat to the reserved shells, I reduced the champagne cooking liquid to less than half of the original amount, then added equal parts of veloute de poisson, heavy whipped cream, and freshly prepared hollandaise sauce. I gently folded those all together, added both red and black caviar and spooned the newly created sauce over the warm oysters. Placed under the broiler, it formed a browned, savory crust to hold in the heat. I sprinkled them with chopped parsley, arranged them on a plate neatly lined with a cloth napkin and sent them out on the floor – to one of my favorite television personalities. My own stomach was in knots and I watched the clock tick. When the door to the kitchen opened, the F & B Director told me to get out in the dining room immediately. My stomach was now on overdrive! Justin Wilson proceeded to tell the restaurant that these oysters were some of the best he had ever eaten. My cooking, he said, compared with the most talented chefs of his native New Orleans and the oysters were something you might see at Commanders Palace. I was very honored – and very proud of being creative. I thought of my mother and her cottage cheese and cinnamon glazed in the broiler; cooking is what I wanted to do for the rest of my life. I purchased a bar and restaurant and operated a catering business. I opened a little café. In time, the commitment and energy exacted by the restaurant business began to wear on me, so I went back to construction, able to spend evenings and weekends with my family, to be there for Christmas and Thanksgiving dinners, to celebrate my son’s birthday. But I missed cooking – so much! How could I make this all work? I began cooking for small, private dinner parties for friends in their own homes. Now, sharing my talents and my love of unique, scrumptious cuisine while maintaining my family life, I have discovered the Perfect Match.